Here's the post I was going to make before I realized this happenened YESTERDAY. I was sitting here and reading another blogpost on the convergence of date and time while on hold with noneofyourbusiness and I watched the clock tick over to 12:35. But for posterity, the kids were playing because they were banned from TV and computers for the day, and I was on hold. Apparently, there was no cosmic significance, and our calendar and timekeeping is an arbitrarily contrived convention. Where were you at 12:34:56 on 7/8/9? Update: Dang, today's the 9th, not the 8th. Well now I feel silly. and didn't wear digital watches. clippers or too much toothpaste. while talking to their personal trainer on the cell phone!!! told that they looked good, instead of filing a sexual harassment claim. real pilots then as Viagra does now for those new age guys. their employees by name and were lifetime airline employees themselves. . .
fervently believing that they are a class of beings unto themselves. Man, now that's a golf fan! Jack Nicklaus is now on par with Santa. Theroblog forums are now easier to reach! Just type forums.theroblog.com into your web browser window. The fine folks over at phpbb.net have fixed the bug that caused my CNAME redirect not to work correctly. So, check it out here! 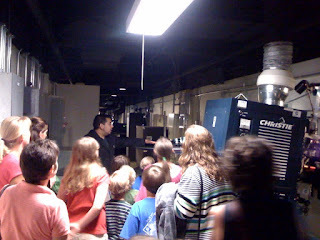 We got to tour the projection area of the Cinemark theater today. Its strange to see the film and analog sound in the digital age. On that note, I am going on the record as somewhat in favor of a rear projection TV technology. Why? I prefer a small amount of fuzzy so I can't see the digital artifacts on most sources I have. Any comments on Blu Ray artifacts? Do you notice it on a flat panel TV? 480p off standard DVD is the best I have out of my Xbox 360. That looks pretty good, but of course a 1080i source would be the highest I can use. Say I'm at Target and something's on super sale or clearance. I post it and you see it. You happen to be next door at Home Depot and you swing by and pick up the hamburger that's 99 cents a pound. Say someone's at another store and they are giving away free ice cream like Gander Mountain was the day before Hurricane Ike. Post it! Then when you're out and about, you pull out your iPhone or compatible device and see what sort of deals are around you and how close by they are! Cheap gas? Take a pic of the price and Post it with your location! Food specials, clearance items, giveaways? Post it! It's pretty simple. Read the directions here and follow them. View my deals I've already posted here.